Mikaela is a process engineer at New Zealand Steel. Looking after the process variables to produce molten steel to various specifications. New Zealand Steel is the sole producer of steel in New Zealand and the only in the world to make steel solely from iron sand. Their process is unlike any other in the world meaning a lot of in-house research and findings. Mikaela’s job is to improve efficiency and quality and reduce cost in this part of the operations. Her most memorable project to date being when her team was able to increase the yield of their vanadium oxide by-product. By using a non-profitable by-product to increase its yield. It was a small project, but allowed Mikaela to see how a small change can have great impacts on overall processes. 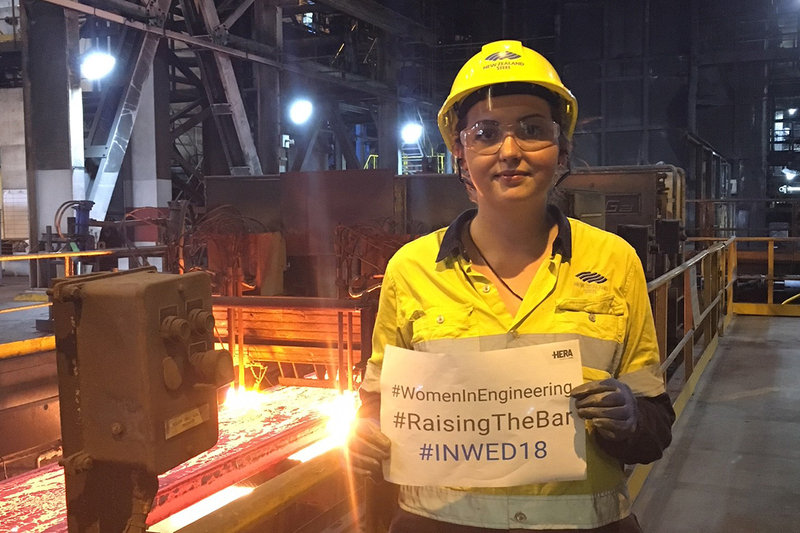 New Zealand Steel Graduate Process Engineer Mikaela Keir in the workshop where she monitors process variables to produce molten steel. Want to know more? Join us as we delve into Mikaela’s career path! So Mikaela, how did your career get started? My top subjects at school were math, science and graphics – but I knew I didn’t want to be confined to an office or laboratory all day! I’m lucky because my parents have always been very supportive. Helping me to make my decision around what qualification to go for. My mother took me to a careers night at school and we ended up talking to the metal work teacher. They suggested trying a year of metal work class, and I’ve never looked back! While doing this class I flourished. The practical application of my skills and assisting students with technical aspects led me into engineering. What is great is that I never received any negative reactions around my chosen career path. I love that every day I get to use my technical and people skills to come to a final solution. I also enjoy the variety of work I’m exposed to. I get to spend time in the office with engineers, in the plant with tradespeople, and in meetings with other departments or customers/suppliers. A mixture of day to day tasks and long term projects means no two days are the same. I’m always reacting to events occurring in the plant – making every day exciting and challenging. What do you think it takes to do your job well? Soft skills are highly valued as an engineer. That’s why I think having great communication skills are key. This way you can share your ideas or decisions with people confidently, and maintain better working relationships. Qualification wise, a degree was the way to go for me. I studied a Bachelor of Engineering (Honours) in Chemical and Materials Engineering. This not only taught me the knowledge, it gave me the problem solving and critical thinking skills to overcome issues in the plant and process. Do we need more women engineers? Every person brings something different to a role – regardless of gender. That being said, it is important to have a diverse workforce. This gives the benefit of having different perspectives and ways of thinking. Giving us the greatest ability to solve problems and create a workforce that better represents our community. For me, gender isn’t a defining feature of a person. That’s why I’m happy I’m treated just as fairly as men in the same role. My company does a lot of work towards diversity, so when I’m working it isn’t often I’m made to notice that I’m a female in what can be classed as a typically male dominated environment. In saying that, I’ve been to a meeting with 40 people and been the only female. This is the reality of current work place environments, and shows there’s a current gender imbalance. In comparison, my university engineering class had an even male to female split. So where did all the females go? I guess it will take time for this new era to make its way into the majority of the workforce – but it’s good to know there is a change occurring. How do you think we get more women into STEM? Early introduction to STEM is important to ensure women have every opportunity to pursue a career in engineering. We should be encouraging from a young age (particularly in early school years), that anyone can do anything. If we can create better gender balance and diversity from an early age this will carry through to later life. This would also help to break down a big barrier which is family mindset and support. This is something that I was lucky enough not to have to face – but I’m sure there are many who do. This is where it’s important to have school programs which can provide support and encouragement to those doubting their ability to pursue such career paths. I would say to those ladies out there who are thinking to follow a similar career path as mine to give it a go! Engineering is one of the most exciting and stimulating careers you can have. Quite literally, the world is your oyster. Engineers are some of the most sought-after professionals in the world which provides unlimited opportunities to work in almost any industry in any country. It is also a career path that provides a lot of variety and flexibility. Each day and every job is unique. It’s what makes me excited to go to work every day.